Some people may say, nothing happened to the Mass. It’s still the same Mass it’s always been. That answer is sadly so wrong. It hasn’t been the same Mass in decades. We’ve had cardinals, bishops, archbishops, priests, and lay people stand up and say that this is not the same Mass and proved why. Ask yourself why. 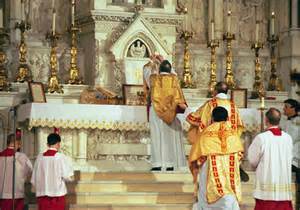 Why do we have a Novus Ordo Missae (which means New Order of Mass) and a Latin Mass? Then ask yourself how. How did we get here? Some of the answers lie ahead. It started back in April and May of 1969 when a small group of theologians, liturgists, and pastors got together to prepare a study of the contents of the New Order of Mass. Preparing this text fell to a Dominican theologian and philosopher, Father M. L. Guérard des Lauriers. At the time he was the professor at the Pontifical Lateran University in Rome. The result of this group was A Short Critical Study of the New Order of Mass (Breve Esame Critio del Novus Ordo Missae) better known now as The Ottaviani Intervention. This was done at the request of Archbishop Marcel Lefebvre, who, at the time, was retired from his position as Superior General of the Holy Ghost Fathers. For his part, Cardinal Ottaviani, drafted a cover letter to Pope Paul VI that supported the Study’s conclusions. Cardinal Ottaviani and Archbishop Lefebvre spoke of six hundred high-ranking ecclesiastics that they hoped would sign this letter. However, in September 1969 the project was compromised when the Critical Study was published which scared off most of the signers. Had this not been the case, it is very plausible that the Study would have moved Pope Paul VI to modify substantially or even rescind the New Order of Mass. Around this same time, Archbishop Lefebvre was approached by traditionalist from the French seminary in Rome. Archbishop Lefebvre was urged to teach these seminarians personally. In 1969 he received permission from the local bishop to establish a seminary in Fribourg. The following year Archbishop Lefebvre founded the Society of St. Pius X and then moved the Society from Fribourg, Switzerland to Écône, Switzerland in 1971. With his health declining, in 1988, Archbishop Lefebvre consecrated four bishops for the preservation of the church. This is what Father Anthony Cekada said, “The significance of The Ottaviani Intervention goes beyond mere historical considerations, however. Since 1969 we have seen the Mass progressively desacralized, made subject to countless aberrations and abuses, and emptied of doctrines essential to the integrity of the Catholic faith. The blame for this painful turn of events has often been laid at the feet of an increasingly “progressive” clergy. What was this group of Roman Theologians protesting about? 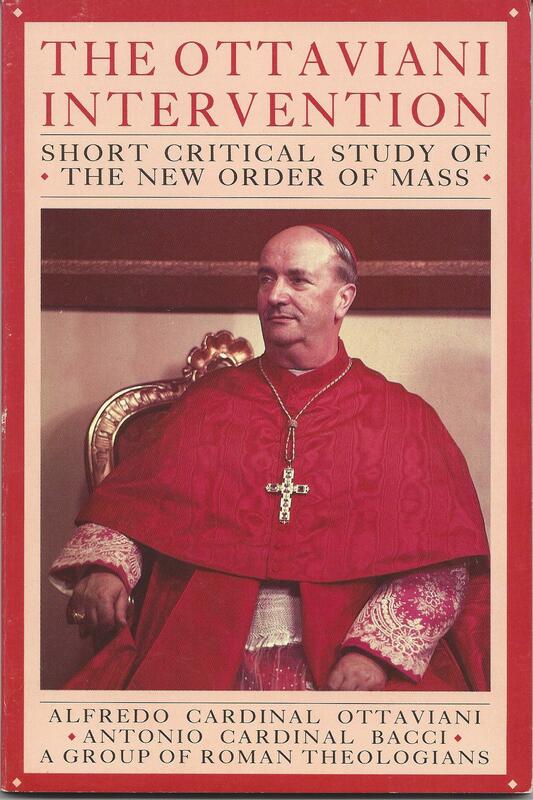 I will highlight some points in The Ottaviani Intervention: Short Critical Study of the New Order of Mass. The definition of the Mass. Changing the purpose of the Mass. The essence of the Sacrifice. The New Order of Mass no longer explicitly expresses the mystery of the Cross and obliterates the Role of the Real Presence, etc. Who performs the Sacrifice? In the old rite, the order went as such; Christ, the priest, the Church and the faithful. In the rite of the New Mass, the role is attributed to the faithful as autonomous. They say, “This is absolute – and hence completely false”. It deviates, most seriously, from the theology of the Catholic Mass. Introducing multiple texts for the Eucharistic Prayer (the anaphora) and deliberately shearing every element of the Roman Liturgy to the point where this new rite brings in closer to certain Protestant liturgies. 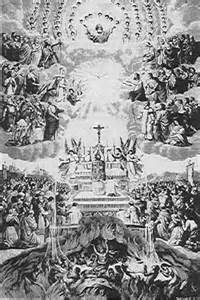 Henceforth, according to The Ottaviani Intervention, “when the Novus Ordo was presented at the Vatican Press Office, it was impudently asserted that conditions which prompted the decrees of the Council of Trent no longer exist. Not only do these decrees still apply today, but conditions are now infinitely worse.” The decrees of the Council of Trent were precisely created to repel those snares which in every age threaten the pure Deposit of the Faith. What should you do? Pray. Pray that God will give you the grace to discern from all the confusion that is out in our world today. 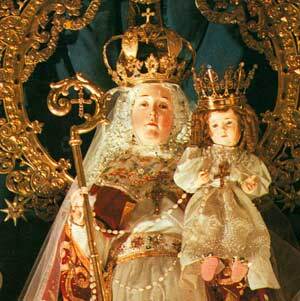 Consecrate yourself to the Militia Immaculata. Research everything. Read books and articles from the past. Read current books and articles. Ask questions. Talk to your friends, family, and priests. Dig deep and pray! 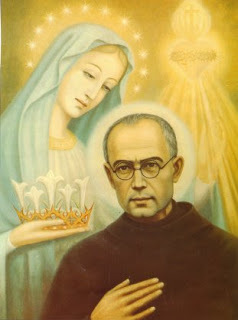 Wear your brown scapular, pray the rosary everyday, and consecrate yourself to the Militia Immaculata, pray to Our Lady of Good Success. This is what will help you get through these times we live in until God can put it right. What do we need? We need faithful priests; “the true followers of Jesus Christ made man”, to boldly stand up and fight for the preservation of God’s church. To truly teach us, once again, how to be and live as pure Catholics! We need our faithful; “those who have given themselves to me”, to boldly stand up and fight for Our Mother, for Her son, Jesus Christ and for the right of every person to save their soul! Go Boldly!